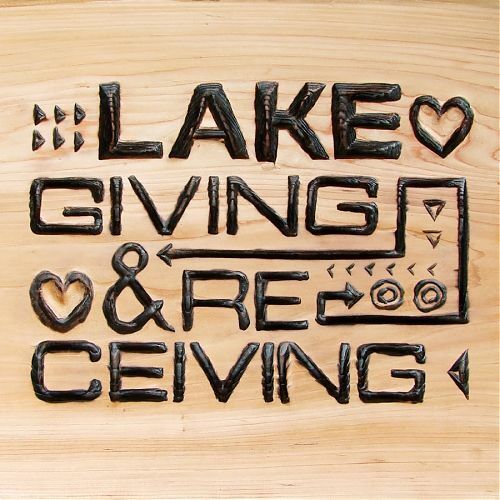 Tapes on the Floor: Album Review: LAKE "Giving & Receiving"
Album Review: LAKE "Giving & Receiving"
A few years back, I opened an envelope containing a record entitled Let's Build a Roof by a band called LAKE. I didn't know it at the time, but it would end up being one of my favorite albums of 2009—a record pregnant with a palpable sense of yearning and perseverance, set against impeccable instrumentation and all expertly put to tape by K Records stalwart Karl Blau. While LAKE's latest effort does not quite match the heights reached by its predecessor, it does present a group that sounds exceedingly comfortable with their current trajectory, demonstrating a willingness to push their boundaries ever so slightly. In terms of its musical formula, Giving and Receiving does not deviate drastically from the band's past output. Almost every song is arranged in an exceedingly efficient manner, anchored by the bouncing pulse of the band's rhythm section and tastefully embellished with synthesizers and an unassuming horn section. The interplay between vocalists Eli and Ashley is another constant—songs like "One Small Step" and "Within Without" find their voices meshing in a pleasant fashion. While the entire record flirts with a variety of twee-pop tendencies, nowhere is it more evident (and somewhat grating) than on "The Stars," a minute long track with a cringe-worthy lyric about denying friend requests. Elsewhere, these same proclivities work to the band's favor, specifically on "Roger Miller," named after the novelty singer/songwriter who would likely approve of much of the wordplay that LAKE employs on this whimsical ode to self-interpretation. The only song that truly breaks the mold is the woozy krautrock of "Mother Nature's Promise," a characteristically plodding number complete with repetitious lyrics and droning accompaniment. At times it sounds like Stereolab by way of Portland, and oddly enough it's a combination that makes for one of the record's most interesting moments. Also of note is the incessant "Skeleton Costume," a track with lush backing that masks some strangely macabre lyrical content. Moments such as these hint at a more experimental side of the group that has yet to be fully realized in the studio. LAKE is a band characterized by their earnest intonations and breezy compositions, traits that Giving and Receiving repeatedly exemplifies. It's not music that relishes in its own technical brilliance, but rather a collection of songs with persevering sentiment. Perhaps the largest detriment is the deceptively effortless sound that LAKE employs, lulling the listener with simplistic melodies and nonchalant refrains. But if you're willing to spend some time with these songs, what you take away from this record echoes the lyrical suggestion of, "The more that you are giving / The more that you receive."